The IVMF and its staff of more than 70 professionals deliver class-leading programs in career, vocational and entrepreneurship education and training, providing service members, veterans and their families with the skills needed to be successful in education, work and life. The IVMF also coordinates comprehensive collective impact strategies; and works with communities and nonprofits to enhance service delivery for veterans and their families. Ready to take your business to the next level? Entrepreneurship Bootcamp for Veterans (EBV) Accelerate is a bootcamp-style program focused on growth and tackles head-on topics such as the financial, management, marketing and strategic planning challenges established businesses face. Veteran EDGE (Engage. Develop. Grow. Evaluate.) 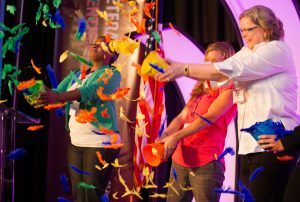 is a four-day conference dedicated solely to veteran and military spouse business owners and the ecosystem that supports them. A women-focused training program in entrepreneurship and small business management that provides tools, ongoing support and business mentorship to veterans, active duty service members and military spouses aspiring to become successful entrepreneurs. Introduction to entrepreneurship available to women veterans, active duty service women, and women military spouses/life-partners who are just beginning to explore the opportunity of small business ownership as a post-service career path. Cutting edge entrepreneurship training program teaching the steps and stages of business creation and business management, with a tailored emphasis on the unique challenges and opportunities associated with being a veteran business owner. Entrepreneurship training program that integrates training with caregiver and family matters, positioning participants to launch and grow small businesses while tending to family responsibilities. Offered to spouses and family members, or the surviving spouse of a military member who gave his or her life in service to our country. Coalition of private sector companies, businesses, non-governmental organizations (NGOs) working to connect veteran and military family-owned business to supply chains of medium-sized and large corporations. CVOB simplifies and facilitates the process of supplying goods and services to larger employees. One-stop shop for everything related to veteran owned businesses. Information available to veterans seeking to begin or grow their business as well as researchers, policymakers, and public and private companies interested in veteran business ownership. Provides veterans, transitioning service members, and their families access to a simple and effective way to access and navigate a range of supportive services in their communities. AmericaServes is the country’s first coordinated network of organizations dedicated to serving the military community by connecting them to the resources specific to their unique needs. Provides individuals working with veterans and military families exposure to a comprehensive overview of U.S. military culture, core values, organizational structure, and history. It addresses a growing national need and perception among veterans that community providers are unresponsive, disrespectful, and lack understanding of the nuances of military culture.